Ivory is the hard, smooth, substance, composed primarily of dentin, that constitutes the tusks, or upper incisors, of elephants (family Elephantidae), including the extinct mammoths (genus Mammuthus), as well as the elephant-like mastodons (family Mammutidae, order Proboscidea). More generally, the term is used for a similar, yellowish-white, dentin-composed substance comprising the tusks and teeth of other animals, including walruses, hippopotamuses, the helmeted hornbill bird (Rhinoplax vigil), and whales (sperm, killer, and narwhal). The term also refers to the tusks or teeth of these animals. While the word "ivory" was traditionally applied to the tusks of elephants (the word is ultimately from Ancient Egyptian âb, âbu, meaning "elephant"), and has expanded to include other animals, today it also is used for imitation substances that resemble ivory. For example, the terms "Genuine French Ivory" and "Indian Ivory" refer to an imitation ivory and there is even a vegetable ivory made form seeds of a South American palm tree (MFMHS). The beauty, smoothness, ease of carving, adhesive hardness, and durability of ivory has made it attractive for many ornamental and practical uses. It has been used for piano keys, billiard balls, bagpipes, buttons, and a wide range of ornamental items. At the same time, the historical popularity of ivory has resulted in rapid declines of elephants and other animals taken for the ivory trade. While ivory can be taken from dead or live animals, most has been taken from live animals, and particularly elephants killed for their tusks. The importation and sale of ivory currently is banned or severely restricted in many countries. Dentin is the main component of ivory. Dentin is a calcified tissue of the body, make up largely of mineralized connective tissue and collagen. It is one of the four major components of most teeth and tusks, the others being enamel, cementum, and pulp. Usually, it is covered by enamel on the crown and cementum on the root and surrounds the entire pulp. Teeth and tusks have the same origins. Teeth are specialized structures adapted for food chewing. Tusks are extremely large modified teeth projecting beyond the lips. Teeth and tusks have the same physical structures: pulp cavity, dentine, cementum and enamel. The innermost area is the pulp cavity. The pulp cavity is an empty space within the tooth that conforms to the shape of the pulp. The porous, yellow-hued dentin is made up of about 70 percent inorganic materials (mainly hydroxylapatite and some non-crystalline amorphous calcium phosphate), 20 percent organic materials (90 percent of which is collagen type type and the remaining ten percent ground substance, which includes dentine-specific proteins), and ten percent water (which is absorbed on the surface of the minerals or between the crystals). There are different types of dentin, differentiated by appearance and stage of development. Because it is softer than enamel, it decays more rapidly, but due to its elastic properties it is a good support for enamel. Its flexibility prevents the brittle enamel fracturing. Elephant tusks are formed with a thin, partial cap of enamel, which soon wears away, leaving the dentin exposed. They do have a cementum layer, referred to by ivory dealers as the bark or rind (Springate 2000). 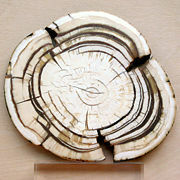 Elephant ivory has a fine, even grain, which is easily carved, and is uniquely characterized by Lines of Retzius or Lines of Schregar, which are visible in cross section and give the appearance of intersecting lines with a diamond shape between them (engine-turned effect) (Springate 2000; MFMHS). Hippopotamus ivory has a thick enamel coating, is denser and harder to carve than elephant ivory, and has a finer grain; it is often used for flat items, such as buttons and inlays (Springate 2000). Walrus ivory has a primary dentin layer and a secondary dentine layer, with the secondary layer having a marbled appearance (MFMHS). The ivory of various animals differ in many other ways (Springate 2000; MFMHS). There are even detectable differences between African and Asian ivory, with African ivory harder and with a translucent, yellow appearance, and Asian ivory softer and with an opaque, white appearance (MFMHS). Synthetic substitutes for ivory have been developed. One imitation ivory is made from cellulose nitrate and another from casein (the phosphoprotein that accounts for nearly 80 percent of proteins in milk and cheese) (MFMHS). In the late nineteenth century, faux ivory was commonly used, and known as Genuine French Ivory, Indian Ivory, Ivorine, among other names (MFMHS). Plastics have been viewed by piano purists as an inferior ivory substitute on piano keys, although other recently developed materials more closely resemble the feel of real ivory. The difference between synthetic and natural ivory is easy to detect by the lack of irregular canal lines in synthetic ivory, and even if high-quality imitations are made with simulated lines, these tend to be repeating rather than irregular (MFMHS). Under ultraviolet light, synthetics will fluoresce a dull blue, and natural ivory a bright blue (MFMHS). A species of hard nut is gaining popularity as a replacement for ivory, although its size limits its usability. It is sometimes called vegetable ivory, or tagua, and is the seed endosperm of the ivory nut palm commonly found in coastal rainforests of Ecuador, Peru, and Colombia (Farrar 2005). 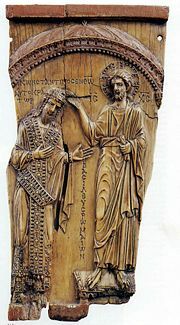 Ivory has been a most prestigious material for carving. Carving of tusks is an ancient art. Mammoth tusks were carved by Paleolithic Cro-Magnons during the late stages of the ice age. 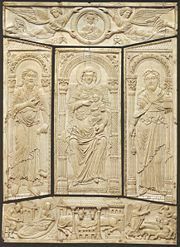 Both the Greek and Roman civilizations used large quantities of ivory to make high value works of art, precious religious objects, and decorative boxes for costly objects. Ivory was often used to form the white of the eyes of statues. The Chinese have long valued ivory for both art and utilitarian objects. Early reference to the Chinese export of ivory is recorded after the Chinese explorer Zhang Qian ventured to the west to form alliances to enable for the eventual free movement of Chinese goods to the west; as early as the first century B.C.E., ivory was moved along the Northern Silk Road for consumption by western nations (Hogan 2007). Southeast Asian kingdoms included tusks of the Indian elephant in their annual tribute caravans to China. Chinese craftsmen carved ivory to make everything from images of Buddhist and Taoist deities to opium pipe (Martin 2007). The Indianized Buddhist cultures of Southeast Asia, including Myanmar (Burma), Thailand, Laos, and Cambodia traditionally harvested ivory from their domesticated elephants. Ivory was prized for containers due to its ability to keep an airtight seal. Ivory was also commonly carved into elaborate seals utilized by officials to "sign" documents and decrees by stamping them with their unique official seal (Stiles 2003). In Southeast Asian countries where Muslim Malay peoples live, such as Malaysia, Indonesia, and the Philippines, ivory was the material of choice for making the handles of magical kris daggers. In the Philippines, ivory was also used to craft the faces and hands of Catholic icons and images of saints. Before plastics were invented, ivory was important for cutlery handles, musical instruments, billiard balls, and many other items. Tooth and tusk ivory can be carved into a vast variety of shapes and objects. A small example of modern carved ivory objects are small statuary, netsukes, jewelry, flatware handles, furniture inlays, and piano keys. Additionally, warthog tusks, and teeth from sperm whales, orcas, and hippos can also be scrimshawed or superficially carved, thus retaining their morphologically recognizable shapes. Ivory can be taken from dead or live animals. For example, tusks of extinct mammoths have been used for the ivory trade. However, most ivory has been taken from elephants killed for their tusks. It is estimated that consumption in Great Britain alone in 1831 amounted to the deaths of nearly 4,000 elephants. Other animals, which are now endangered, have also been preyed upon. For example, hippos, which have very hard white ivory prized for making artificial teeth have been a focus of the ivory trade (Tomlinson 1866). Due to the rapid decline in the populations of the animals that produce it, the importation and sale of ivory in many countries currently is banned or severely restricted. Much of the decline in population is due to poachers during and before the 1980s. Since the worldwide ivory trade ban in 1989 there have been ups and downs in elephant populations, and ivory trade as bans have been placed and lifted. Many African countries including Zimbabwe, Namibia, and Botswana claim that ivory trade is necessary—both to stimulate their economies and reduce elephant populations that are considered to be harming the environment. In 2002, the United Nations partially lifted the ban on ivory trade, allowing a few countries to export certain amounts of ivory. The effectiveness of the policy remains in question. Farrar, L. 2005. Could plant ivory save elephants? CNN.com, Apr 26, 2005. Retrieved July 19, 2008. Hogan, C. M. 2007. Silk Road, North China The Megalithic Portal. Retrieved July 19, 2008. Martin, S. 2007. The Art of Opium Antiques. Chiang Mai, Thailand: Silkworm Books. ISBN 9749511220. Mel Fisher Maritime Heritage Society and Museum. (MFMHS). n.d. Everything you wanted to know about ivory, but were afraid to ask. Mel Fisher Maritime Heritage Society and Museum. Retrieved July 19, 2008. Springate, M. 2000. 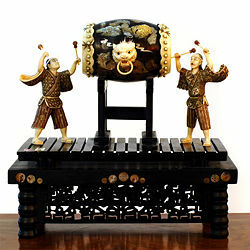 Identifying different types of ivory Uniclectica Antiques & Collectibles. Retrieved July 19, 2008. Tomlinson, C. (ed.). 1866. Tomlinson's Cyclopaedia of Useful Arts. London: Virtue. Stiles, D. 2003. Ivory carving in Thailand Asianart.com. Retrieved July 19, 2008. This page was last modified on 26 July 2008, at 22:56.